A Day Late and A Dollar Short: World Famous Harlem Globetrotters Return to ATL's Philips Arena March 17th! World Famous Harlem Globetrotters Return to ATL's Philips Arena March 17th! Yeah baby! 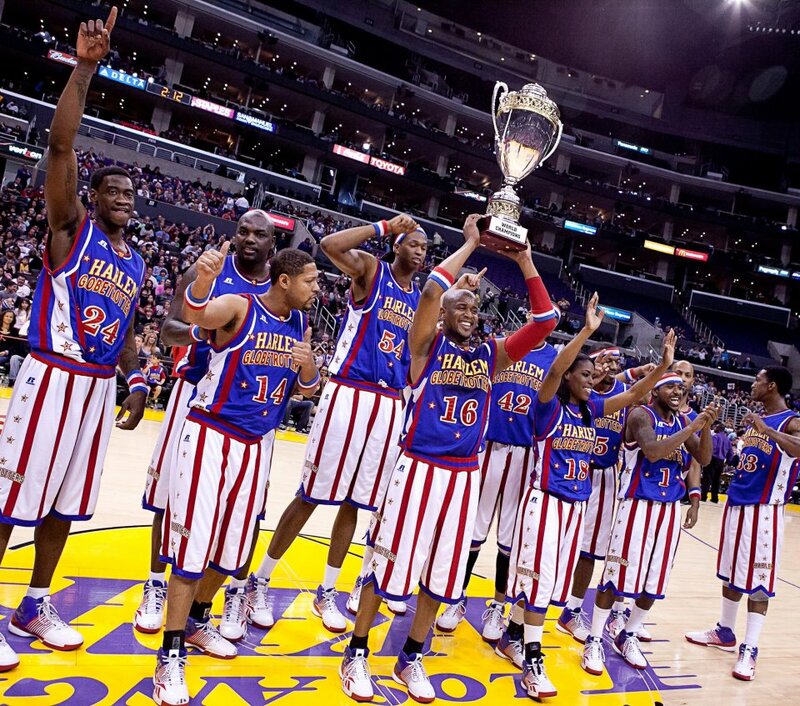 The World Famous Harlem Globetrotters return to ATL's Philips Arena on Saturday, March 17th at 7PM! I am SO excited to be seeing them again this year! Last year was the first time my boys and I were able to witness the Globies in person, and we loved them. I loved the excitement and fun they brought to the arena, and I was amazed at their mad skillz in person! To purchase your Family Four Pack offer/tickets, you can visit the Ticketmaster website. Just make sure you select the Family Four Pack selection. Fun Facts and Talking Points - Current Globetrotters stars Special K Daley, Big Easy Lofton, Flight Time Lang, Dizzy Grant, Scooter Christensen, and many others will team up with the world class rookies for nearly 270 games on the North American portion of the World Tour, bringing the Globetrotter magic to over 230 cities in 46 states, the District of Columbia, and five Canadian provinces. Outstanding rookies - Paul “Tiny” Sturgess, the world’s tallest pro basketball player at 7' - 8'; Jonte “Too Tall” Hall, the shortest Globetrotter ever at 5' 2"; and Fatima “TNT” Maddox of Temple University, the team’s first female player since 1993 and 9th female in team history! New Globetrotters & Top Three Finishers from the 2011 College Slam Dunk Contest - Reigning champ Jacob “Hops” Tucker, at 5' 10", sports a 50-inch vertical leap; slam dunk runner-up John “Jet” Williams of UNC-Asheville; and semi-finalist Darnell “Spider” Wilks of the University of Cincinnati! You can also follow the Harlem Globetrotters on twitter at @Globies. March 17th is approaching quickly! Get your Family Four Pack now, and maybe I will see you at Philips Arena in a few weeks!